I remember that day. I remember January 28, 1986 because it was one of those moments in time that you can’t forget. I was a junior at Birmingham High School in Van Nuys, California. I was sitting in my AP History class when a student burst in and said that the Challenger had exploded. We thought that he was kidding but soon learned that he was not. The networks ran the video footage of the explosion all day long. It was a moment that showed glimpses of a future when instant information would flood all sources of news and information with endless amounts of noise. That is one of the challenges of today, finding an effective way to sift through the noise so that we can determine what is significant and what is not. The US Civil War or The War Between the States is something that has always interested me. For a brief timeline of the war click here. Those of you who are not from the states probably are less familiar with this and how many Civil War buffs are still walking around today. Many of them spend copious amounts of time involving themselves in reenactments of battles and life as it was during that time. Civil War Reenactment HQ offers a collection of information about this including a lists of events, units, and a beginners guide to reenactments. The Civil War Reenactors Homepage has a lot of information as well. But what I really wanted to write about here are those old time photographs that we see from that time period. Photography was much more time consuming and difficult than it is today. 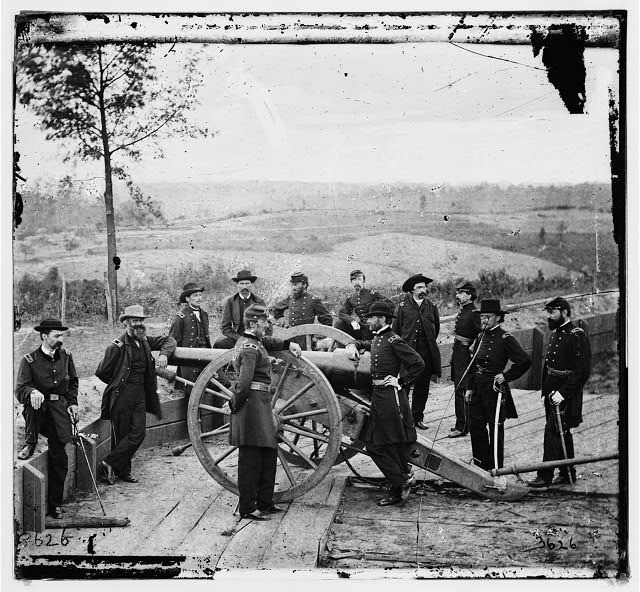 The Selected Civil War Photographs Collection contains 1,118 photographs. 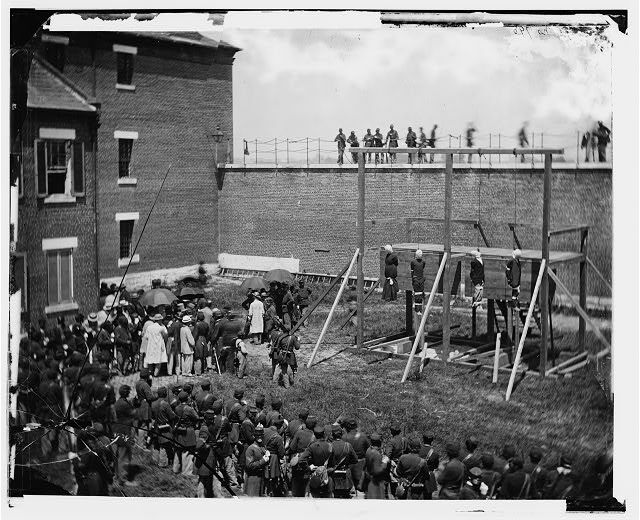 Most of the images were made under the supervision of Mathew B. Brady, and include scenes of military personnel, preparations for battle, and battle after-effects. The collection also includes portraits of both Confederate and Union officers, and a selection of enlisted men. An additional two hundred autographed portraits of army and navy officers, politicians, and cultural figures can be seen in the Civil War photograph album, ca. 1861-65. (James Wadsworth Family Papers). The full album pages are displayed as well as the front and verso of each carte de visite, revealing studio logos, addresses, and other imprint information on the approximately twenty photographers represented in the album. If you are not familiar with the story of President Lincoln’s assassination I would recommend that you read more about it here. It is a fascinating story and a reminder that Booth was not alone. [Atlanta, Ga. Gen. William T. Sherman, leaning on breach of gun, and staff at Federal Fort No. 7]. 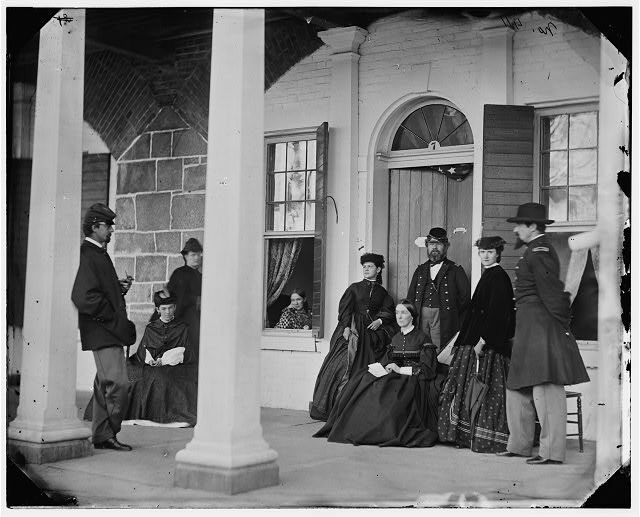 Fort Monroe, Va. Officers and ladies on porch of a garrison house]. I recently received an anonymous email that accused me of having a bad case of blog envy. It seems that they think that I must be very bitter that I don’t have more readers and that the brands haven’t bequeathed their bounty upon me. It was kind of fun to read. Been a while since I got anything that resembled hate mail at least something that didn’t go off onto some antisemitic or anti-Israel rant. One of my favorites was the email that went on about Palin the Prophet. I responded to them that they mean to write Profit, but I never did hear back from them. Darn. Anyway, back to my new friend the anonymous emailer. In my younger years I would have shared your email with all 17 of the longtime readers and the few stragglers that come along for the ride. But the kinder, gentler, er, dumber Jack accidentally deleted it and emptied the trash so we’ll have to do without for now. Here is my response to your comments. I don’t spend any time courting the brands. I don’t pitch PR agencies about my blog. Don’t spend any time talking to them about how influential my blog is. And I don’t lose any sleep over that. I don’t feel an ounce of remorse for writing that some of the bloggers who are currently considered to be popular and or powerful would not be without gifts to give away. Their content is weak and their community is dependent upon the gifts they give. This joint has moments of brilliance and moments of mediocrity. Over time it has developed a respectable following. I won’t deny that I think it would be great to have six times as many uniques and ten times the number of comments. It would be great. But I want to earn that. I don’t want to by popularity. We’re not the Yankees. We don’t use our enormous payroll to buy championships. We earn them.